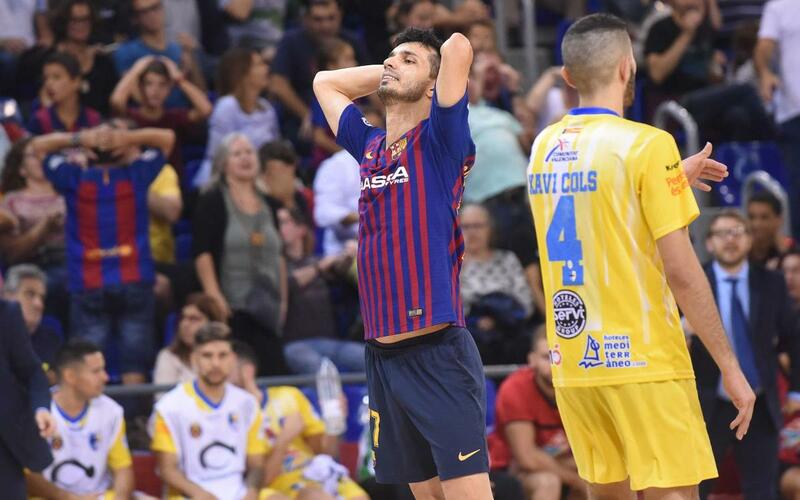 Barça Lassa suffered a Friday night defeat against Peñíscola Rehabmedic (1-2) at the Palau Blaugrana, as they were plagued by bad luck in the second half. Goals for Dani Montes in the 12th minute and Hugo in the 29th meant a strike from Esquerdinha counted for nought, giving the Blaugrana their first home loss since a 2-3 result against ElPozo a year ago. An evently matched first half saw the return of Léo Santana, nine minutes in, as he made his comeback through injury. It would be through a Dani Montes free kick that Peñiscola took the lead, and that was followed by misses for Esquerdinha, Ortego and Santana as the opening period ended 0-1. After the halftime break, Dyego hit the post before Esquerdinha grabbed an equaliser for Barça Lassa. He did so in the 26th minute, from close range, taking the score to 1-1. Arthur nearly gave his side the lead a few minutes later, clipping the crossbar with a chip over the away team's goalkeeper, but it would be Peñiscola who scored next. The game-winning goal arrived on the 29 minute mark, through Hugo. Dyego, Esquerdinha, Ortego, Adolfo and Ferrao all hit shots against the frame of the goal late on, as an evening of bad luck in the attack ended with a first defeat of the year.